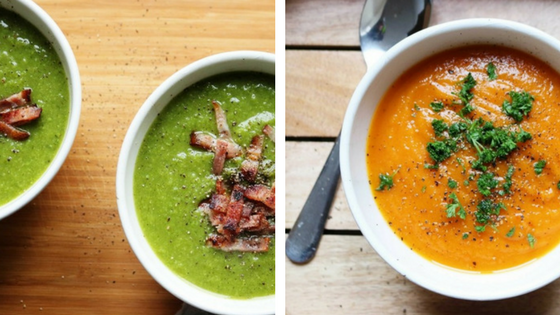 This week I’ve got 2 soup recipes for your meal prep pleasure. These recipes are perfect in more ways than one. They taste great, are easy to make, and really versatile making them adaptable to suit the targets of your daily macros. Added to that, it’s pretty damn cold these days, so a nice warm, hearty soup is just what the doctor ordered. Soups are a particularly great food choice when you’re on a cut as the fat values are typically low, making them very macro friendly when you’re on limited calories. As they have a high water content they’ll also take up a good amount of space in your stomach, so you’ll feel fuller for longer. These recipes are designed for you to add things to them depending on what suits your macros. If you want to add more protein, the cook up some chicken and drop that in. It works really well. Need more carbs? Then how about adding a nice crusty roll to dip in the soup and mop up every last drop when you’re done. Heat the oil in a large pot and fry the onion and garlic for 3 minutes on low heat. Add in the sweet potato, carrot and bell pepper and cook for 5 minutes on high. Stir occasionally. Add the water and the vegetable stock cubes, bring to boil and simmer the soup for 20 minutes. Puree the soup with a hand blender, and season with salt and pepper. Pour the soup in bowls and garnish with chopped parsley. Dissolve the chicken stock cubes in the boiling water. Add in the potato and cook for 5 minutes. Next add the sliced leek and let everything boil for 10 minutes. Lastly add in the peas and cook for a further 5 min. Puree everything with a hand blender. Top the soup with the bacon strips and season with salt and pepper. There you have it. Two tasty recipes to warm up those cold winter evenings and add a much need flavour kick to your nutrition plan. Make sure you subscribe to the blog by putting your name and email address in the box below. That way you can be kept right up to date when new recipes and other blogs get posted. You’ll also be on the mailing list for exclusive offers on my coaching programmes. Next week I’ll be showing you a twist on an old bodybuilding favourite, the omelette as well as some tasty pancakes that will satisfy those cravings without sending you totally off the rails.